Loop to attach to girth; has neck strap with flat leather over withers, 2 straps attach to saddle rings. 5/8” to 7/8” Quality Flat leather. Running Martingale Attachment is 27” long including the 1 3/4” diameter rings. Neck Strap over withers is 1 3/8” wide tapering to 5/8” one each side. 5/8” flat leather with scored edges, loop to attach to girth, has flat leather neck strap over withers, leather pinch guard behind center ring, & 2 adjustable straps attach to saddle rings. Comes with matching buckle in standing martingale attachment. Side pieces measure approx 25" not including rings or tugs. Strap back to girth shows some dirt & wear & buckle adjustment is rusty but works fine. Brand unknown. 1” flat leather running martingale with white contrast stitching, scored & darkened edges, 5/8” neck strap, fancy stitching at fork, 1 1/2“ diameter rings. Measures 47” as adjusted now in 1st hole(shortest) out of 7 holes. Stamped Equitana Romania, but no size. Comes with rubber martingale stop/ring. Leather is quality thick leather, but is a little dry on martingale strap with surface cracks when tightly bent. Neck strap still supple. 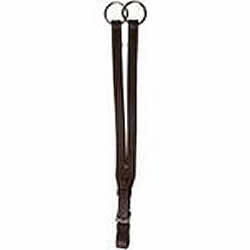 3/4” leather martingale strap, 5/8” neck strap-both have Raised center. Running Martingale Attachment in flat leather, buckles into any breast plate with a center ring. Matches most popular bridles. Almost 16” long, 5/8” wide leather, single buckle end. 5/8” quality leather with Raised center. Loop attaches to English caveson under chin; Loop to attach to girth; has neck strap. Running martingale attachment in 1/2" flat leather with scored & rubbed edges, is adjustable, & snaps into any breast plate or breast collar with a center ring with a sewn in spring snap. Matches most popular bridles. Approx 18” long as adjusted now with 2 more holes to make smaller & 5 more holes to make larger. No tags or maker mark so brand unknown, but is quality leather. Courbette was established in 1976 to offer North American riders access to premium European riding equipment. The Courbette name is synonymous with traditional values, innovation and quality and old world craftsmanship. Breastplates help to keep the saddle in place. It attaches to the front D's on the saddle and between the horse's forelegs to the girth . Ideal for hunting, eventing, jumping or in a hilly country. A standing martingale attachment comes with this breastplate. Fully raised body strap in 5/8” width and raised neck strap. Narrow design for showing. Absolutely lovely! 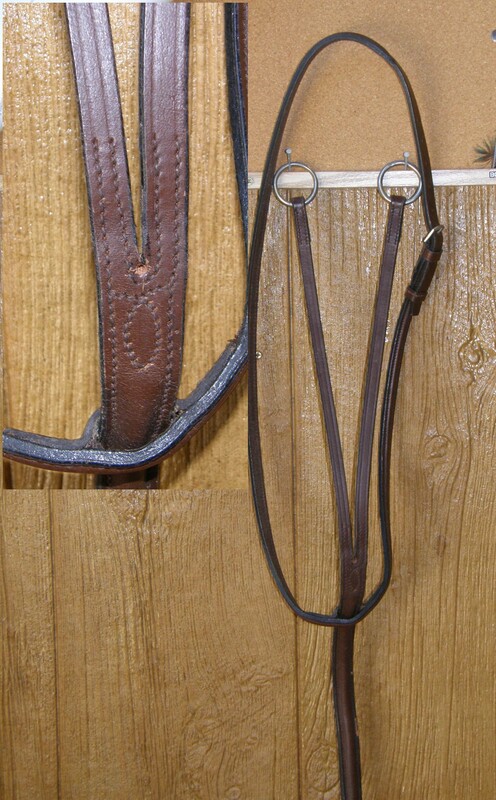 1” flat leather with loop that attaches to English caveson under chin, loop to attach to girth & has neck strap. Stamped Made in India, but leather is supple yet sturdy & looks like good quality. Stamped OS for Oversize which will fit Warmbloods & XL horses. Measures 52" as adjusted now with 2 more holes to make smaller & 4 more to make larger. Excellent quality bridle leather breast plate or breast girth with strong stretch elastic center insert, detachable double adjustable neck strap. Breast girth section measures 30 1/2” not including straps. Great jumper, polo or eventer breast plate. Excellent used condition with only minor dirt/wear to elastic. Lovely soft leather! Flat leather English breastplate with loop to attach to girth, has 3/4” leather neck/chest strap with shaped doubled & stitched flat leather over withers, 2 straps attach to saddle rings & small snaps have been added for easy on/off. Leather has scored & darkened edges & contrasting stitching. Neck Strap over withers is 1 3/8” wide tapering to 3/4” one each side. Chest/side pieces measure approx 21 1/4” not including rings. Not stamped as to maker or brand, this is nice quality, but not the best quality, so probably imported leather. 1” quality flat leather with 5/8“ rounded raised center. Loop attaches to English caveson under chin; Loop to attach to girth; has rounded raised neck strap. Stamped Weaver Leather & C for Cob. Click the horse to go forward or back! !